In places where limestone outcrops cover extensive areas, natural erosion has given rise to a beautiful landscape referred to as "karst," dominated by exposed rock, often with white cliffs and ridges, and riddled with small to large caves. Rainwater quickly drains away into the caves, leaving behind parched conditions at the ground surface where only a few species of trees can prosper. 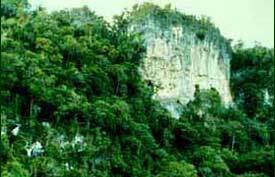 The forest here, usually called limestone forest, is dominated by the molave tree (Vitex parviflora), which tends to grow in the few pockets of deep soil, with clumps of bamboo, palms, and small leguminous trees and figs occupying much of the remaining land. The diversity of plants here is low, but those that are present tend to be highly restricted, unique species that provide habitat for a unique set of insects, reptiles, amphibians, and mammals. Karstic areas some of the most crucially important habitat for bats, many of which roost in caves or crevices. These places often are especially important as the locations of maternity colonies for bats during limited portions of the year. Natural erosion has given rise to a beautiful landscape referred to as “karst.” Limestone forest only occur where there are unusual soil conditions.